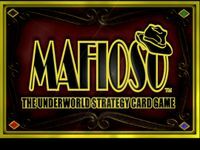 Mafioso is a game of cards and dice set in the seedy world of organized crime. In it two to five players must compete to build the most lucrative criminal empire while preventing their opponents from doing the same thing. Players are each dealt a hand of seven cards from which they play Wiseguy cards to form a Crew, and then in turn use their Wiseguy's "stats" (Honor, Greed, Power, and Influence) to play Front Company and Racket cards to build wealth. They may also use their "stats" to play War cards to attack opposing Crews, destroy opposing Crews' Empires, or steal their opponents' Rackets for themselves. Also, they may attack enemy Crews directly using Dice attacks, forcing wiser, wealthier Crews to defend themselves with strategic use of their own resources such as Wiseguy Modifiers and Retaliation cards. As the game progresses, Rat cards are added to the deck, a threat to every Crew on the table. The goal of Mafioso is to be the Crew with the most valuable Empire on the table at the end of the game, for only the crew with the most lucrative Empire will be chosen by Big Sal to remain a part of the Gouldini Crime Family, and the rest will be "fed to the fishes". The 2nd Edition features vastly improved card designs as well as additional Wiseguys, Rackets and Front Companies.